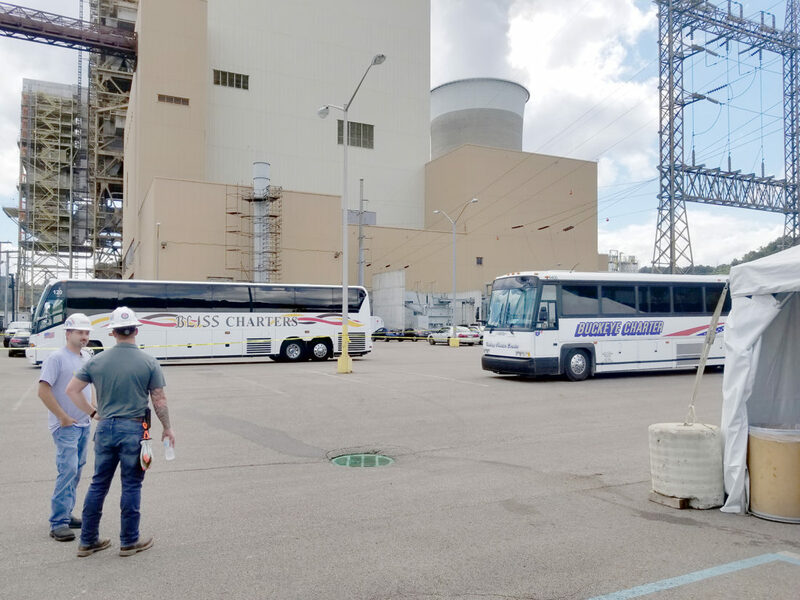 BRILLIANT — As students and members of Ohio’s Electric Cooperatives boarded tour buses to go through the Cardinal Plant electric generating facilities Thursday, Doug Miller, vice president of statewide services for Ohio’s Electric Cooperatives, explained that a replacement is being prepared for the Obama administration’s Clean Power Plan. The CPP, often touted as a part of what was seen as the administration’s “war on coal,” is being replaced by a new rule that doesn’t regulate “beyond the fence” of electric power stations, Miller explained. Ohio had joined 25 other states in suing the U.S. Environmental Protection Agency over the CPP and the Supreme Court eventually stayed the plan. With the change from the Obama to the Trump administration, a new clean energy rule is being implemented. “It regulates carbon dioxide emissions from power plants inside the fence. There are not standards on the implementation of efficiency requirement or renewables. It is a more balanced approach and gives more control to states over how to regulate and control carbon dioxide emissions,” Miller explained. The Buckeye Power cooperative took over management and operation of the 1,800-megawatt coal-fired plant on March 1. Buckeye Power owns Units 2 and 3 and now manages the entire plant under the banner of the Cardinal Operating Co. Cardinal is turning 50 years old this year. Miller said the plan for Buckeye Power under the new regulation isn’t changing from Buckeye Power’s inception more than 50 years ago. “We continue to be about clean, safe, reliable and affordable power for our members. We think coal is a valuable and meaningful resource for generating power,” he said. Cardinal underwent about $1 billion in environmental control investments to reduce sulfur dioxide, nitrogen oxide, carbon dioxide and mercury emissions. “We were able to do that while keeping rates stable for a number of years and our philosophy has not changed,” he said. Buckeye has made natural gas plant investments and plans to continue to do so, but the plan is to keep burning coal at Cardinal. AEP announced earlier this year a plan to convert Unit 1, which it owns, to natural gas by 2030. Miller noted the Obama-era Clean Power Plan sought a 30 percent reduction in carbon dioxide emissions from 2005 levels. Cardinal, he said, has achieved a 27 percent reduction without the federal regulation and continues to aim for the 30 percent reduction. He said the discovery of natural gas in Ohio has led to low prices and an abundant supply. He said coal as a fuel is struggling not because of the emission requirements but because of market forces at work, which is driving utilities to convert to natural gas plants. Miller, who has been in the utility industry for 30 years, including 28 with Ohio’s Electric Cooperatives, doesn’t anticipate base-load plants to switch to renewable sources, which he termed as better for peaking, intermittent use plants, but not to displace basic capacity. Patrick Higgins, spokesman for Ohio’s Electric Cooperatives, said more than 500 electric consumers visited the plant Wednesday and Thursday for annual tours by cooperative members and students. The state’s 24 electric cooperatives supply electricity in 77 of Ohio’s 88 counties. The cooperatives arose out of the 1930s, when President Franklin Delano Roosevelt’s New Deal programs worked toward rural electrification. The cooperatives are self-governing and do not fall under Public Utilities Commission of Ohio regulation, but are locally controlled by member boards. One of those members, Bob Hoelle, came from Hamilton to tour Cardinal Thursday. He said the plant wasn’t online when he last visited in 2012, and he wanted to see it in operation with all the environmental controls and improvements. “It was an eight-hour drive for an hour tour or so, but I wanted to see it in operation. There was a billion dollars spent on this and I am a cooperative member. I have been a trustee on the board (of Southwestern Ohio’s Butler Rural Electric Cooperative) since 2000. Local members ask me questions and I can let them know up front what I have actually seen,” he said. “It was very important that all of this was put on. Buckeye wants to be a good steward, as do all our local trustees on the board. We all want to do what is right for the environment,” Hoelle said. He said people need to be aware that the vapors coming out of the plant are water vapor, not smoke. “This plant, for being coal fired, you wouldn’t know it if you didn’t see the piles of coal,” he said. Miller explained students remain involved with the local plants through the BE3 Smart program, which includes about 4,000 students across Ohio. Local students toured the plant and are supplied with kits to do a home energy audit, learn about energy efficient LED lighting and low-flow shower heads and talk with their parents about energy efficiency.